Ronnie Hampton scores a layup during the first half vs. Springboro. Rashad McKee drives into the paint past Springboro defender Noah Moser. Tallice Landers buries a 3-pointer during the first half. 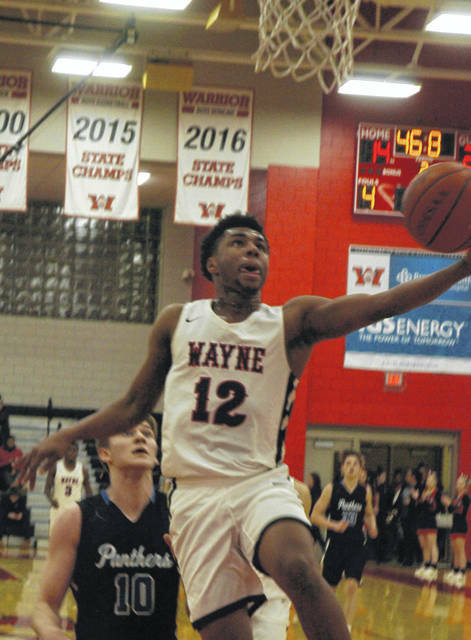 Landers scored a trio of treys during Wayne’s victory over Springboro. 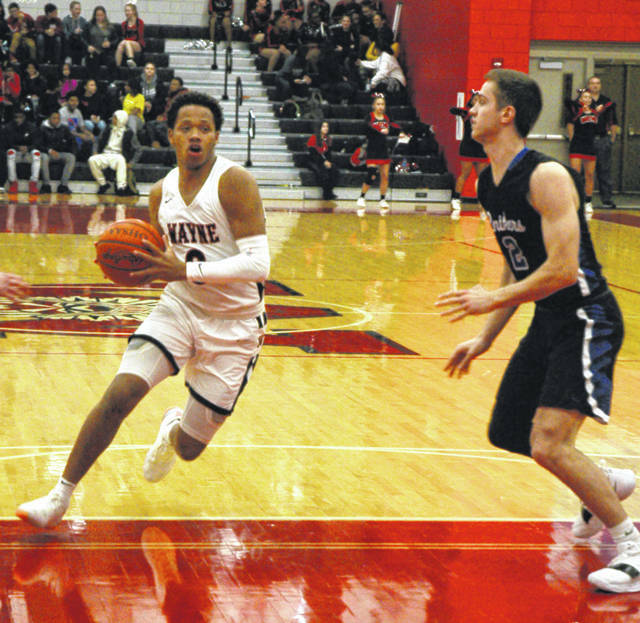 HUBER HEIGHTS — Ronnie Hampton scored six points in overtime Thursday and came up with a steal in the final minute to help lift Wayne to a hard fought 63-58 victory over Springboro. The senior guard led the Warriors with 18 points while fellow seniors Rashad McKee had 17 and Tallice Landers scored 11. Springboro controlled the tipoff in OT but put up an errant shot. McKee scored to put Wayne up 55-53. Connor Grevey, who paced the Panthers attack with 17 points including five 3-pointers, drew a foul from Bobby Cole and buried both free throws to tie it. Hampton answered with a 10-foot jump shot and Michael Berner scored inside for ‘Boro to tie it at 57. Berner then fouled Brian Hill who sank the front end of two free throws but Jahrod Lankford controlled the rebound on the second shot for Wayne and McKee drew a foul inside from Garett Powell. McKee hit one free throw to put Wayne up 59-57. Lankford fouled Willieon Yates who hit one of two from the charity stripe to make it a one point game and Wayne called timeout with 1:01 remaining. When play resumed Hampton took the ball inside and drew a foul from Powell and sank both shots to put the Warriors up 61-58. The Panthers put the ball into Grevey’s hands and he launched another 3-point attempt that caromed off the rim. Berner snared the rebound but Hampton immediately came up with a steal and was fouled by Noah Moser. 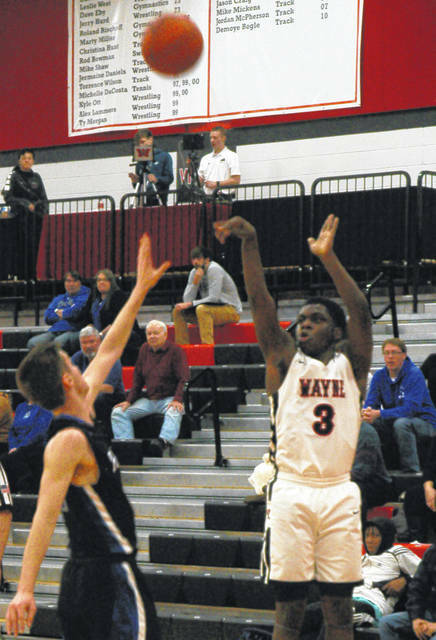 Hampton sank both shots with just over one second remaining to give Wayne a 63-58 win. Yates and Powell had 14 points apiece and Berner 10 to contribute to Springboro’s attack. Springboro: Willieon Yates 3-6-14, Kameron Dickerson 1-1-3, Garett Powell 5-4-14, Michael Berner 5-0-10, Connor Grevey 5-2-17. Totals: 19-13-58. Wayne: Rashad McKee 7-2-17, Branden Hill 1-0-2, Tallice Landers 4-0-11, Brian Hill 1-2-4, Malcolm Curry 2-0-4, Jordan Long 1-0-2, Ronnie Hampton 6-6-18, Bobby Cole 1-0-2, Jahrod Lankford 1-0-3. Totals: 24-10-63. Three-point goals: Springboro: 7 (Grevey 5, Yates 2); Wayne 5 (Landers 3, McKee, Lankford). Records: Springboro 5-8 (1-6), Wayne 7-6 (5-2).